This post contains a rundown of Aldi Regular Buy Indian food. You can find brief takes on some of their Special Buy items here. Keep in mind that Aldi sometimes shifts food from one category to another, so what is a Regular Buy might become a Special Buy, or vice versa. Also, some Regular Buys are regional, so what is a Regular Buy in one area may be a seasonal Special Buy in another. (January 2019): We’ve received reports from readers that at least some Aldi stores are introducing a new version of the Journey to India Tikka Masala. This new version is easy to spot because it has 45 calories per serving rather than the original 70 calories. This reduced calorie count appears to have come at a cost, though, because reader reviews of the new tikka are overwhelmingly negative. We haven’t tried the new tikka ourselves — it’s not currently in our stores — but if we do we’ll be sure to write about it. We also don’t know if this tikka will eventually replace the tikka nationwide. In the meantime, if you’ve tried the new tikka, feel free to leave a comment about your take. My husband and I love Indian food, but we live on a budget and can’t always eat at restaurants. When we crave Indian food, we are mostly relegated to preparing meals at home with products from an international grocery store with an unreliable stock, from the small selection of offerings from Target, or from Aldi when it rolls out certain Special Buys. We even recently tried frozen Indian meals from Trader Joe’s, which is Aldi’s upscale cousin, and we were not impressed. No store-bought Indian food so far has been as good as the food we get at restaurants (although Aldi’s Journey to India Tikka Masala Simmer Sauce in a jar comes closer than anything else), but we continue to try new things when we discover them. Today we’ll look at an array of Regular Buys. One note before we begin: at the store, another woman who was shopping asked an employee if the Indian entrees in the freezer were very spicy. I couldn’t help chiming in and mentioned most Indian food I buy from grocery stores isn’t too spicy. At most, it has a little kick. Restaurant food tends to be much more spicy, depending on the chef. After having sampled those foods from Aldi now, I can say that nothing is overly spicy, except the Special Buy Specially Selected Jalfrezi Curry Sauce. The directions say to heat oil in a saute pan, add salt- and pepper-seasoned chicken (I use 1 to 2 chicken breasts, depending on how saucy I want the meal to be) and brown evenly. Then add green and red peppers and the whole jar of sauce. Cover the pan and simmer over low heat for 10 to 12 minutes until chicken is thoroughly cooked. Serve with basmati rice. I used pre-cooked chicken, didn’t add peppers, and I only heated the sauce until it began bubbling so all the liquid didn’t cook off; I like my Indian food to have a lot of sauce. This is our favorite Aldi Indian sauce. It has good flavor, the right amount of spice (but not too spicy), and tasted a lot more like restaurant sauce than almost any other store-bought sauce we’ve purchased, in or out of Aldi. I initially regretted that I only bought one jar because it was a limited-time Special Buy, but now that it’s a Regular Buy item I’m happy I can buy it whenever I want to at Aldi. To prepare, heat oil in a saute pan, season chicken with salt and pepper and brown evenly in hot oil. Add onions and other vegetables along with the jar of simmer sauce. Cover pan and simmer over low heat for 10-12 minutes until chicken is cooked through. Enjoy with rice. I used pre-cooked chicken and did not add vegetables. The jar does not indicate how much chicken to use, but I use 1 to 2 chicken breasts, depending on how saucy I want the meal to be. 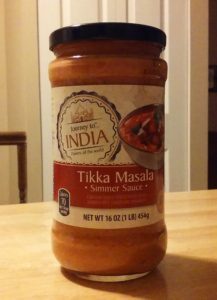 This sauce has a decent mild flavor, and tastes fine, but the Tikka Masala Simmer Sauce is more flavorful, tastes more authentic, and remains the winner in my book. It prepares similar to the other simmer sauces: heat oil in a saute pan, season chicken with salt and pepper and brown evenly in hot oil. Add onions and other veggies along with the entire jar of sauce. Cover the pan and simmer over low heat for 10-12 minutes until chicken is cooked through. Enjoy with rice. As I did with the other simmer sauces mentioned above, I used two pre-cooked chicken breasts and did not add vegetables. I had never never tried Jalfrezi sauce before, so I don’t have a standard to which I can compare it, but this was quite good. It has some small chunks of tomato and diced peppers in it and has good flavor but is not too spicy. Of all the Journey to India simmer sauces Aldi sells, the Tikka Masala tastes best, followed by the Jalfrezi, and then the Korma. 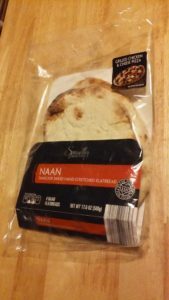 Aldi’s naan comes in regular or garlic flavors (my family prefers regular), is pretty authentic, and is a Regular Buy item. It arrives at the store frozen. I know this because I’ve picked it up off the bakery section shelf while still frozen. Each package comes with four slabs of bread, and each piece of bread serves one to two people, depending on how hungry you are. The bread warms easily on a baking sheet for two to three minutes at 400 degrees in the oven, and you can scoop up tikka masala or buttered chicken with chunks of bread for a good meal. It even comes with instructions for making little pizzas if Indian food isn’t your thing. As a general rule, we think Aldi’s best Indian offerings are the Regular Buys. 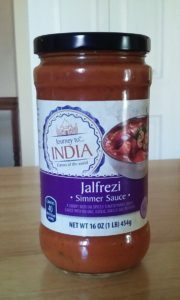 Aldi’s Regular Buy Journey to India Chicken Tikka Masala Simmer Sauce, sold in a jar, is our favorite, with an authentic taste and lots of good flavor. The Regular Buy Journey to India Korma Simmer Sauce and Journey to India Jalfrezi Simmer Sauce are decent. Outside of sauces, Aldi’s Regular Buy naan tastes authentic and is worth purchasing, and the Regular Buy basmati rice is also good. Journey to India, Specially Selected. Bookmark. excellent review!! I’m SO excited about these news sauces. my local Aldi no longer has them in the Special Buys aisle- they are among the regular items. I can understand what you mean about wanting a thicker sauce. to get the most out of the simmer sauces, I’ll add a generous bit of water to the jar (1/3 to 1/2) to clean it out and pour it back into the pan with the sauce and browned chicken. I let the sauce simmer on low/med for 20 minutes, stirring occasionally. I just had their Jalfrezi sauce last night and LOVED IT. I still have to try their Tikka Sauce. I think the Jalfrezi tastes better when cooked a little longer to allow the tomato to become sort of “jammy” but this does require you to stand over and stir frequently to make sure you don’t burn it. 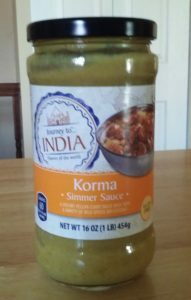 I really like the Journey to India Korma simmer sauce- went to purchase another jar and there are none left- somebody must have liked it. Did you say it’s a ” regular item” thank you! As far as we know, it’s a Regular Buy now. That may not be true in all regions; what is a Regular Buy in one part of the country can be a Special Buy in another. We just had the journey to India tiki masala sauce with chicken tonight for dinner. I prepared just as the instructions directed. We loved it! Even my husband who is not a fan of curry gave it a thumbs up. I plan on making it again and again. I really liked the tika masala, but not the korma (first 2 items listed). Haven’t noticed or bought the other products. Great review. I almost bought the Naan and regret I didn’t. Next time I’ll get it. Some ideas… use it with chicken in your Pressure Cooker or slow cooker. Cauliflower and chick peas are also nice additions. If you have an air fryer you can add a few tablespoons to toss over some chick peas and air fry. Another idea is to buy the precooked frozen Wings (we like the buffalo wings) and add them to the sauce to give it some heat. Their basmati rice is so good. A pat or two of butter and garlic is nice added when cooking the rice. I think it would also be good made into cilantro rice (look up the recipe for cilantro rice… delicious). Where can i get these speciality buys Journey to India products at Aldi naperville? The Special Buys are not in stores right now. The Regular Buys are. I just tried the Aldi bottled Jalfrezi sauce. I used chicken and a few vegetables. I am fortunate enough to have a number of Indian markets in town and my pantry is well stocked with authentic pastes, spices and sauces, including Jalfrezi. After preparing the sauce I tried some with a bit of Aldi Basmati rice. The verdict? My opinion is that the sauce is not very good, it simply lacks the taste that one would expect from an “authentic” Indian dish. Simply said … it tastes bland. The reviewer rated the sauce as “decent”. This is a bit generous. In reality, I’m not sure why I am disappointed with the sauce as this product was sold in an attempt to satisfy a wide range of ethnic and cultural backgrounds so it should be of little surprise that it tastes a bit like ketchup. I still enjoy most of my shopping experience at Aldi … but if I wanted relatively authentic Indian food I would go to my pantry or an Indian restaurant, not Aldi. You are absolutely correct about the Tikka simmer sauce. I have had it at least five times…it is delicious. Big fan of the Tikka Masala sauce. I went a little different direction. I grilled chicken thighs over charcoal then put them in a cast iron pot. Poured the sauce on, flipped them once and backed in the oven at 350 for 20 minutes. I served the thighs whole with curry vegetables over couscous. Mediterranean olives on the side. I would buy the three products by the case if Aldi would ever order and keep that much on hand- these have become a staple in my home. The Jalfrezi is the spiciest,IMO,and my favorite. All three have different tastes,but can be prepared the same. 2 potatoes,cubed,and 2 onions sliced and quartered. one sweet bell pepper,and some jalapeno slices for some kick. 1 diced zucchini and or eggplant. Fry potato til light brown,add other ingredients,and fry another 2 minutes. I use 2 cans of chicken breast cubes,with the broth to finish off and deglaze. Then add the sauce. Works equally well to top rice or ramen noodles. This recipe takes less than 15 minutes,and makes 4 big servings. Yes, this is a HIT!!! Just wanted to add, NO- these sauces are not going to satisfy a true curry lover, if your expectation is home cooked Indian food. But- if you know anything about curry,you can add a few things to bring up the spiciness. I’m sure they make the sauce toned down to satisfy the majority. They wouldnt turn much product if it was full of ghost peppers and coriander like indiginous quisine. Does anybody remember the Chicken Tikka Masala that came in a box with rice? I bought it and thought it was very good. Sounds like the one in the jar is just as good and I will just make some basmati rice to go with it. I LOVE these sauces! I’m not a vegetarian, but go sparingly with meat (chicken). Use lots of whatever veggies you like (onions, peppers, carrots, potatoes, sweet potatoes, zucchini, squash, peas, celery, broccoli, etc.). Cut chicken and veggies into bite sized pieces and stir-fry with a small amount of olive oil ’till tender. Add any simmer sauce (Jalfezi is my favorite) and a can of no-added-salt diced tomatoes. Lower heat and simmer 20 minutes or so to marry the flavors. Awesome with a simple salad and rice. Can anyone confirm that the Journey to India Tikka Masala recipe has changed? Our family ate it once a week and loved it so much. The last two times I bought it, there was only a cumin/coriander flavor and no curry flavor. I have never had authentic Tikka Masala before so have nothing to compare it to. I would really appreciate another review revisiting this brand. Do you have an old bottle to compare the ingredients list with? That would be my first way of checking…it also could be the spices were from different batches and that’s why it tasted different. I don’t eat it often enough to give a qualified answer otherwise…sorry. Our family eats the Journey to India Tikka Masala on a regular basis and we’ve noticed no changes in flavor. Thanks, Fig Newton, but that isn’t the jar. It is the regular Journey to India. I did as repete suggested and found the ingredients list online at https://www.fooducate.com/app#!page=product&id=57BE191F-971C-2B44-4F27-B2AD1FBE2F76 and compared it to the jar I had kept. The ingredients were not the same, but it is the same jar. They are similar, but not the same. So I went on a quest to find a recipe and the one that tasted like what we were used to can be found here: https://www.allrecipes.com/recipe/239867/chef-johns-chicken-tikka-masala/ Rachael, I’m glad it hasn’t changed on you. I have a feeling they changed their recipe and it’s simply a matter of the old jars being replaced with the new ones. Hopefully, I’m wrong and you can enjoy the simple process of pouring a jar into a skillet. I am going to stick to this recipe I found as the new flavor is very disappointing. O.K. T.K., my apologies. Thanks for the information…I’ll try your suggested recipe and maybe that new “Specially Selected” one. Glad you found a solution. If I am lucky enough to find the old ’s Regular Buy Journey to India Chicken Tikka Masala Simmer Sauce, I’m going to stock up. Aldi should quit changing things for the sake of change,or reducing calories. They’ll end up reducing customers,too. This is among our favorite picks at Aldi and is a regular buy for us. I have seen the special buy jars with the spice mix on top, but haven’t tried it yet. I usually use fresh chicken, 3-4 colored peppers, and 3 jars of sauce, and The instant brown rice. I brown the chicken in a little oil, season with salt and pepper, throw in the julienned pepper strips, and then pour the sauce in. I simmer covered for 10-15 minutes and meanwhile prep some instant brown rice. It is delicious!